Dr. Anandakrishnan is a distinguished alumnus of the Institute of Technology at the University of Minnesota. He completed both his Master's of Science (1957) and Ph.D. (1960) in civil engineering. During his time at the University of Minnesota he was the president of the Indian Students' Association as well as the president of the Foreign Students' Council. In 1958 he was awarded the Order of Ski-U-Mah for his student leadership. Dr. Anandakrishnan is currently vice chairman of the Tamil Nadu State Council for Higher Education Academy and Chairman of the All-India Board of Undergraduate Studies in New Delhi. He also serves as adviser to the chief minister of Tamil Nadu on information technology and e-governance and is the chairman-designate of the Madras Institute of Development Studies. Dr. Anandakrishnan previously served as vice-chancellor of Anna University in Tamil Nadu, and from 1978 to 1989 he was a senior official at the United Nations Center for Science and Technology for Development (UNCSTD) in New York. From 1974 to 1978, Dr. Anandakrishnan served as science counsellor at the Indian Embassy in Washington, D.C. These international experiences enabled Dr. Anandakrishnan to have an understanding of and an influence in development issues well beyond his own field of civil engineering. On his return to India, he took the lead in the establishment of the first National Accreditation System for Technical Education in India. Subsequently, he took a leading role in negotiating for India with the World Trade Organization (WTO) to establish criteria for educational services under the General Agreement on Trade in Services (GATS). Dr. Anandakrishnan has been the recipient of many national and international awards in recognition of his work. 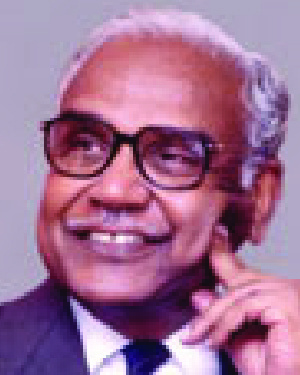 These include the National Order of Scientific Merit, conferred by the Government of Brazil in 1996, the Man of the Year Award for contributions to educational excellence in 1999, and the Padmashri Award in 2002 from the president of India for commendable service to the cause of education. In naming Dr. Anandakrishnan as a winner of the Distinguished Leadership Award for Internationals, the selection committee cited his life-long commitment to improving the quality of technical education in India and other developing countries. He has been successful in implementing major structural changes in the curricula of technical universities and colleges in India as well as taking the lead in advocating the use of information technology for academic governance and research.